Biodiversity is constantly being altered by anthropogenic and natural variants. Due to ocean acidification, and rising ocean temperatures, coral reef systems have degraded, and algae has come to dominate some of these systems. Macroalgae are aggressive and quickly colonize areas where coral has been degraded, and heavy algae cover of dead coral substrates prevents recovery of dead coral communities. A study conducted by Kuempel and Altieri (2017) set out to discover how coral reefs adapt to changing environments and how individual species living along the reefs promote resilience. The presence of herbivores, such as parrotfish, sea urchins, and other small grazing fish around degraded coral reefs likely halts the shift from coral-dominated areas to algae-dominated areas. Understanding the rate of recovery for coral reef dynamics can help scientists predict future coral resiliency and aid conservation efforts. Kuempel and Altieri studied coral reefs on the Caribbean coast of Panama after a recent hypoxic event killed over 90% of coral on some reefs in that area. They chose to study this area because it has high anthropogenic stress, increasing the chance of a higher rate of algal dominance after coral disturbances. Using field surveys, herbivore manipulation, caging, and algal transplant, Kuempel and Altieri were able to study the relationships between herbivore populations, pressures that herbivores face, and grazing importance in relation to other algal mitigating factors. This study found that there was no correlation between mass coral reef deaths and high rates of macroalgae cover. A large number of herbivores, mostly small grazing fish and invertebrates, around dead coral areas was almost always able to prevent macroalgae from colonizing. Many species of smaller herbivores were able to escape the pressures of overfishing and effectively graze coral reefs in place of large keystone herbivores. 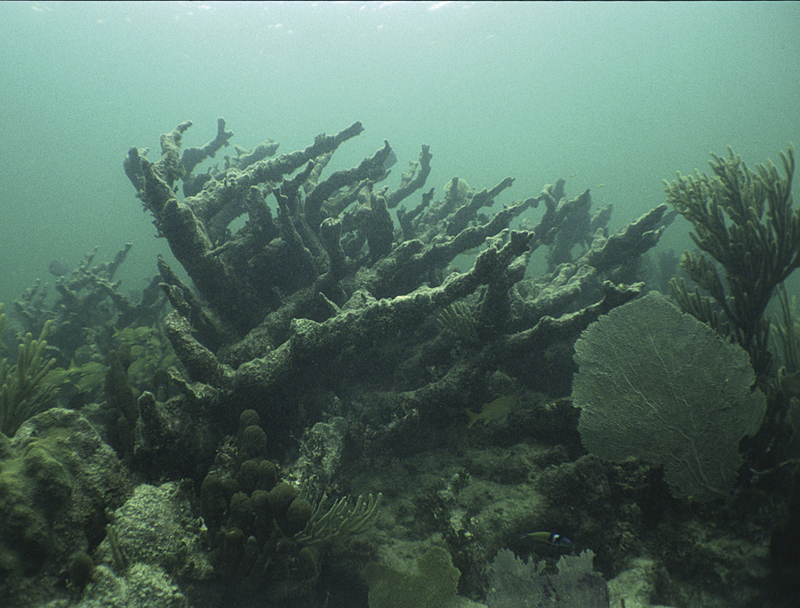 This prevented macroalgae from aggressively colonizing places where live coral cover was very low. Initial diversity in coral reef fish species is important in degraded coral reefs to overcome anthropogenic pressures and stifle macroalgae growth. Further research must be done to determine whether grazing by small herbivores can shift a coral degraded area into a coral dominated area and how this will impact future coral resilience. Kuempel, C.D., Altieri, A.H., 2017. The Emergent Role of Small-Bodied Herbivores in Pre-empting Phase Shifts on Degraded Coral Reefs. Scientific Reports 7, 10:1038. This entry was posted in Coral, Natalie Ireland and tagged Andrew H. Altieri, Caitlin D. Kuempel, coral reefs, Macroalgae, Smithsonian Tropical Research Institute, University of Queensland by Emil Morhardt. Bookmark the permalink.